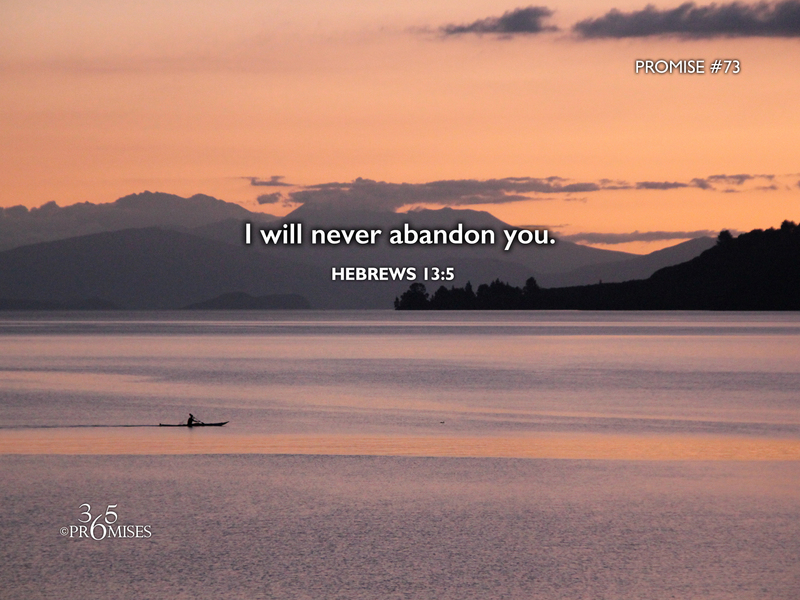 In today's Bible verse, the writer of Hebrews encourages us to be content with our lives because our God and Father has promised to never leave us or forsake us. In the knowledge of our Papa's closeness, we can take a deep breath and simply rest in His nearness. We don't have to be anxious about anything. We don't have to covet anything, because we have all that we need in the arms of our Heavenly Father. If we are not convinced that everything we need can be found in the intimacy and fellowship found in God the Father, the Son and the Holy Spirit, we will seek other things in order to be satisfied. However, if we truly believe in our heart that God will never leave us or forsake us, we will know that we have indeed found the pearl of great price. No matter where you go, God goes with you. If you have received the free gift of Jesus' life, then you are the dwelling place of the Holy Spirit, whether you feel His presence or not. God will NOT abandon you! He is closer to you than you possibly could imagine. My prayer for each one of us is that we would be convinced more of this promise today than ever before! He will never leave you or forsake you...never!